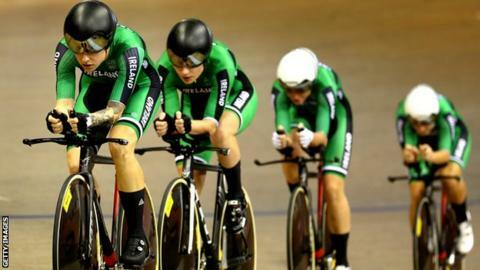 Ireland's Women's Team Pursuit foursome set a new national record to clinch 10th place at the UCI Track Cycling World Championships in Poland. The team of Orla Walsh, Mia Griffin, Alice Sharpe and Kelly Murphy clocked a time of 4:29.148 to shave over two and a half seconds off the previous mark. Australia were the fastest team during the qualifying session in 4:14.915. "We came here to ride under 4:30, finish in the top 10, and break the Irish record," said Murphy afterwards. "We prepared pretty hard and our coach Brian Nugent got us in the right zone for the day. "We're really satisfied with the result and just want to thank everyone at Cycling Ireland for giving us this opportunity." The quartet, who were making their championship debut, were the first team in the 17-strong field to take to the track for the qualifying session with the top eight teams advancing to the first round. The previous Irish record of 4:31.66 was set by Lydia Boylan, Josie Knight, Caroline Ryan and Mel Spath at the 2015 European Track Cycling Championships in Switzerland. Lydia Gurley was the other member of the Ireland squad in action on the opening day of the championships and finished in 12th place in the Women's Scratch final. The 34-year-old attacked during the closing stages but was caught with two laps remaining as Team GB's Elinor Barker took gold ahead of Kirsten Wild of the Netherlands and Belgian rider Jolien D'Hoore.